The convenience and added value of voice dialing and voice command and control in wireless devices is very well established. Voice search and voice navigation has become mainstream in smart phones and tablets. 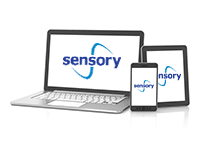 Sensory provides a full suite of software only solutions for very high accuracy speech recognition that doesn’t wear down the batteries (lower MIPS requirements), offers fast response time, and works great in noise. Sensory’s TrulyHandsfree™ Voice Control has been established by market leaders as the standard for low power voice wakeup with speaker verification. Speaker Verification on a phone can be used as a password enhancement or replacement, and since it’s on the client handset, is very secure and does not require the phone to connect in order to use it. Wake up word options include fixed phrase triggers (predefined), end user defined triggers, end user defined passwords with authentication, and predefined fixed phrase passwords. These wake up words can lead to a cloud based solution (trigger to search), where Sensory has prepared samples of all the audio plumbing to make it work! These wake up words can also lead to embedded TrulyHandsfree high accuracy command sets. 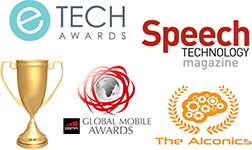 Sensory’s TrulyNatural fluent speech engine allows large vocabulary and natural language functions on mobile devices such as name dialing, music search, calendar entry/retrieval, destination access on maps, camera and clock control, and text messaging.